Cartouche: "Fur and Claw - Steel and Flame"
Comments from Jed: "I think maybe I had the most fun with this one; I had a lot of fun. It's kind of a Star Wars scenario where they fly around in these little single-man fighter craft, and so to bring it back into a medieval fantastical situation I had them flying on the clouds. Flying around on clouds with weapons, with your clothes flapping ... was a lot of fun to think about, and a lot of fun to draw. 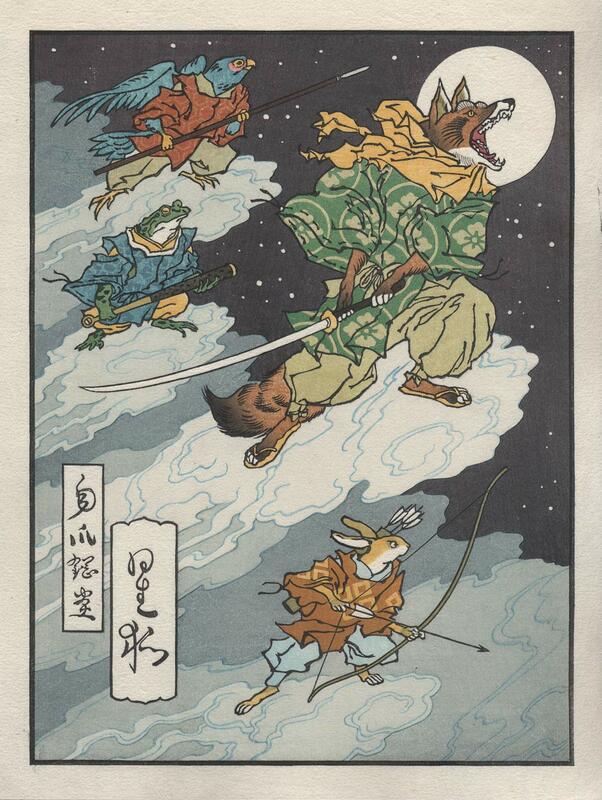 "I also came back to how Yoshitoshi was able to draw animals so realistically; Kyosai as well. 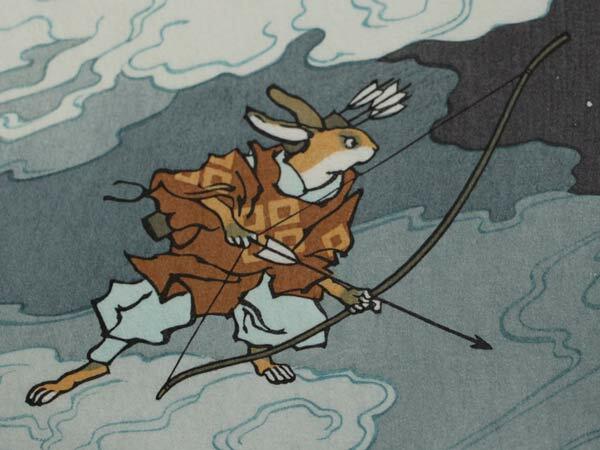 I borrowed off Kyosai a lot when thinking about this design. The naturalism that they use to draw things was a big inspiration. 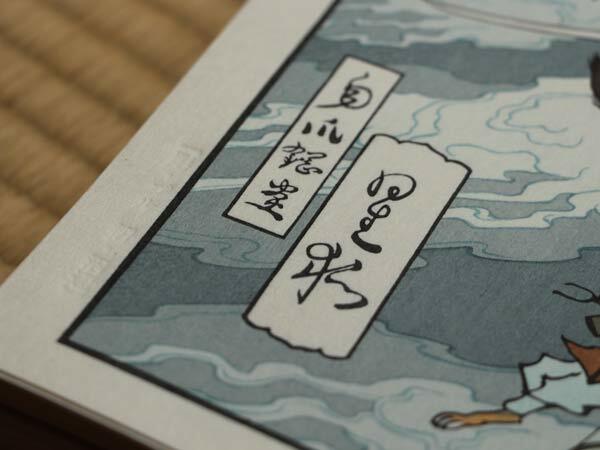 Slippy in particular is based quite heavily on a Kyosai frog; I love those Kyosai frogs ..."
Comments from Dave: "This design is far and away the most popular in this Ukiyo-e Heroes series (followed by the Rickshaw Cart), even though the game on which it is based lags far behind some of the other games in popularity. But Jed's wonderful concept, and the way he pulled it off - you can practically feel those clouds scudding across the print as you watch! - has taken this one to the top of our 'chart'. 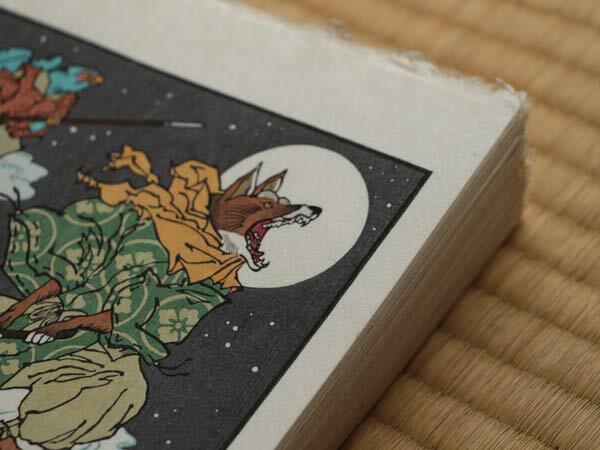 It's not the easiest of the designs for us to print - it has a double key block (one for the main black outlines, and one for the clouds), and if these are mis-registered by even as much as a hair's width, the subsequent colour printing will never come together. But what a wonderful design ... another one that will still be popular long after we who have made it are long gone ..."